Kind time of a day, dear Guest! Let's introduсe U - Nataly and Olesya Soltanovich. We are glad to see U on the pages of our web-site! Bobkot is glad to acquaint you with our favourite animals. 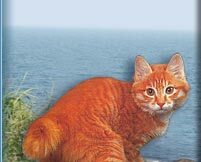 The " Kuril ridge " cattery with Pleasure represents wild, but cultivated short-tailed cat living on islands of the Far East of the Kuril ridge - Kurilian bobtail. On pages of our web-site we'll try to tell about features and beauty, about grace and force of these surprising breeds which were created with the Nature! Chairman of one of the oldest Clubs of Moscow "Cat's Home" - Hrameshina Natalia Valentinovna, the big expert and the fan of cats. The "Kubri" cattery with which we together conduct breeding work. The Hospitable and complacently adjusted inhabitants of Kunashir island . And also, the son of the founder of our cattery Kurilian bobtail, - Frant Ml. Pontiyskiy. Here you can always choose the kitten who has liked to U and to become its owner already soon. For this purpose it is enough to call to us or to write. Pleasant news - has earned the button "FAQ"